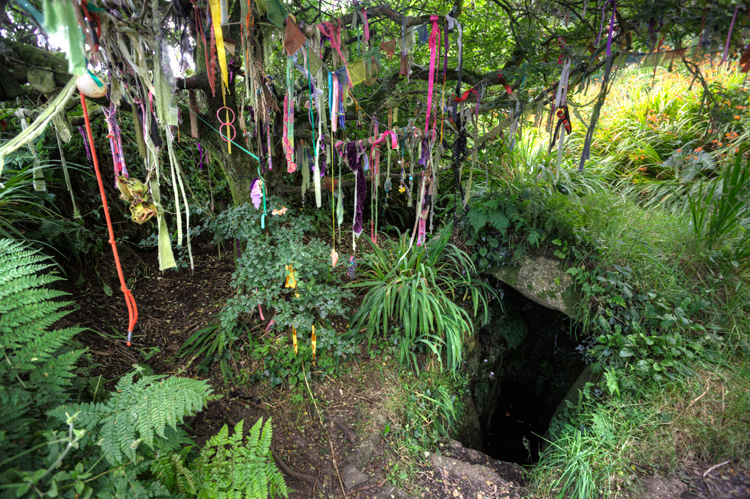 This beautiful Well in the far south-west of England here near the hamlet of Sancreed on the West Penwith peninsula. The Well itself lies in a pine and holly grove, in a womb-like chamber, covered with corbelled stone walls and roof. The water level in the Well has reduced in recent years suggesting a change in the water table. The water is clear and cold but has a high radon measurement. The Well was rediscovered by the Vicar of Sancreed in 1879 and looked after by Juliette Shanks (a plaque marks her name). It has the feel of a magical grotto with its moss surrounds and behind the Well are the remains of a fifteenth century Chapel. There is a circular churchyard nearby which always suggests a place of ancient origin (stone circle?). In 1910 a modern Celtic cross was placed near to the Well. It is dedicated to St.Credon, a mythological saint, and pilgrims often offer ‘clouties’ (rags) nearby. Like many such places it has come to be venerated for the spirit of the place (genus loci) that dwells there. It is thought of as sacred healing place. On ‘The Modern Antiquarian’ website it says, ‘no matter the antiquity of this well the tranquil atmosphere it exudes makes it ever a sacred place.’ (ravenfeather posting March 2014) and on The Megalithic Portal site map it shows just how many ancient sites can be explored in this area of Cornwall close to Sancreed.